The Royal Canadian Air Force created a new precision aerobatic team in 1959 to celebrate the 50th anniversary of powered flight in Canada. This demonstration team was named the Golden Hawks . The RCAF’s plane of choice was the swept-wing F-86 fighter jet. RCAF F-86 Fighter Jet is designed by North American Aviation Co. It was built in Montreal by Canadair Ltd. a civil and military aircraft manufacturer in Canada. The F-86 had serviced the RCAF since 1948. From August 1950 to October 1958, Canadair Ltd. built 1,815 Canadian F-86 Sabres in Montreal. Orenda turbojet engines, built by AVRO CANADA, powered them. The Golden Hawks team was made up of 7 planes, and performed at air show throughout Canada and the United States. The Golden Hawks performed at 317 shows from 1959 to 1963. Unfortunately, the team was officially disbanded for financial reasons on February 7, 1964. The plane(#23649) was acquired by the members of Brockville #426 Wing of the R.C.A.F. ASSOCIATION. 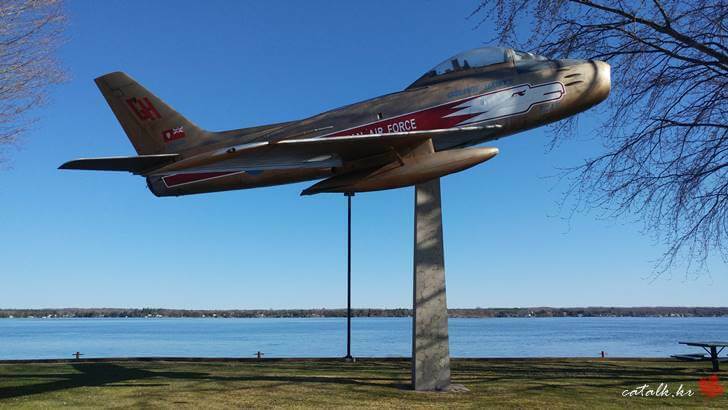 It was mounted at the Brock Trail, in Brockville, Ontario in 1968, in memory of all Allied airmen who lost their lives in the cause of freedom. 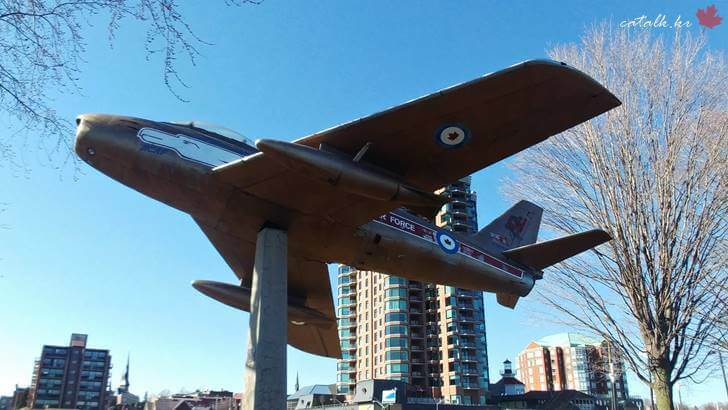 The fighter jet was erected by the City of Broville and Heritage Brockville, in 2008, and funded by the Brockville Community Foundation and Brockville RCAF Association. Next to the F-86 is Women’s Memorial against for Violence . It would be nice to look at it together.